Happy Chinese New Year - What Does It Mean for Business in Dubai? If you missed the ‘dress in red today’ office memo, think ‘Fu’ is a chemical element, don’t associate Spring Rolls with gold bars and are a little unsettled by dancing Dragons, you may not be aware that today heralds in the Chinese New Year. Marked by the new moon day of the first lunar month and centered on traditional Feng Shui practices, Chinese New Year or Lunar New Year is now celebrated by more than 20% of the world’s population. Not surprising as much of the world’s modern economy has been closely tied with China since it opened to capitalistic trade in the early 1980’s. In Chinese astrology, each new-year of a twelve-year cycle is associated with one of five Yin-Yang elements and one of twelve animals, along with a colour. So, Kung Hei Fat Choi! Welcome, ‘Year of the Red Fire Monkey’. How will the quintessentially lovable and cheeky monkey affect the serious stuff of business in the coming twelve months? One notable Hong Kong based brokerage firm warned that it is a year for slow, considered expansion and not raucous monkey antics. They also predicted that while the Chinese economy would likely dip through the first six months, a big upswing was expected toward the end of the year. Sustaining the growth of Dubai-China trade is a key strategic aim of the UAE. Dubai Customs announced the value of overall trade with China over the last four-years had reached DH527 billion. China was Dubai’s top trading partner in 2014, with bilateral trade volume valued at Dh174.84 billion, reflecting a 29% growth rate over the previous year (source; Emirates 24/7 December 14, 2015). In a statement, Abu Dhabi’s Crown Prince and Deputy Supreme Commander of the Armed Forces, Sheikh Mohamed bin Zayed Al Nahyan said that there are common ambitions for further developing those ties in the coming years, for example by restoring the Silk Road trading route (source; Arabian Business December 13, 2015). According to a number of celebrated Chinese Astrologers (and shared by Rhonda Abrahams of Asbury Park Press), this coming year will be particularly fortuitous for those born with the element of Fire in their sign - often associated with SMEs and Entrepreneurs. So don’t be offended if someone compares you to a monkey this year. While this particular primate may appear flighty and somewhat erratic, they can also be highly focused, creative, inventive and intelligent. Furthermore, 2016 is also an ideal year for launching a new business venture, mergers and expansion. especially if you are planning to tap into that lucrative Chinese market). Just remember that the real "luck" in life is driven by your own positive attitude, hard work and the right advice. 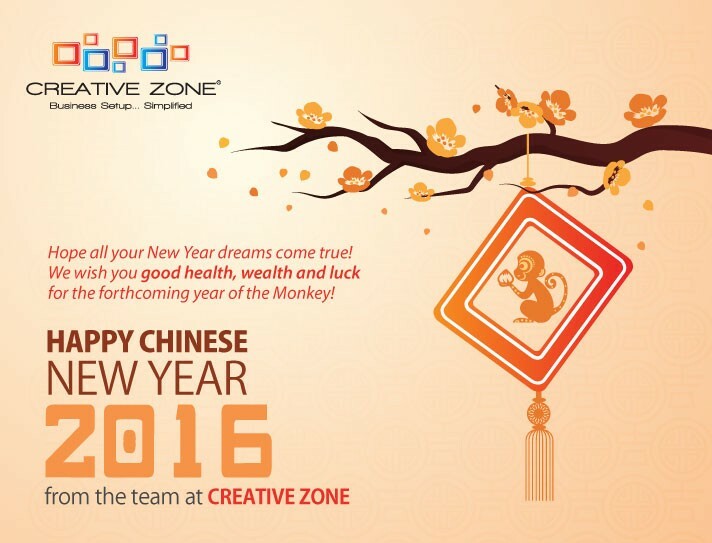 Kung Hei Fat Choi from the team at CREATIVE ZONE!